The Zooxer is an add-on that serves as a trading aid for the MetaTrader system (at this stage, MetaTrader 4 only). Its function is to present as much relevant and important information as possible on the various currency pairs, thus providing a clearer picture of the pair trend and the advisability of entering any position. When we look at a particular currency pair and decide on its direction, the pair’s view of the pair’s balance of power does not necessarily tell us the real situation of these currencies in the market. In order to understand the real state of a particular currency in the market, we must examine its Currency Strength, which means its position via all the other currencies in the market, and compare it to the status of the second currency. 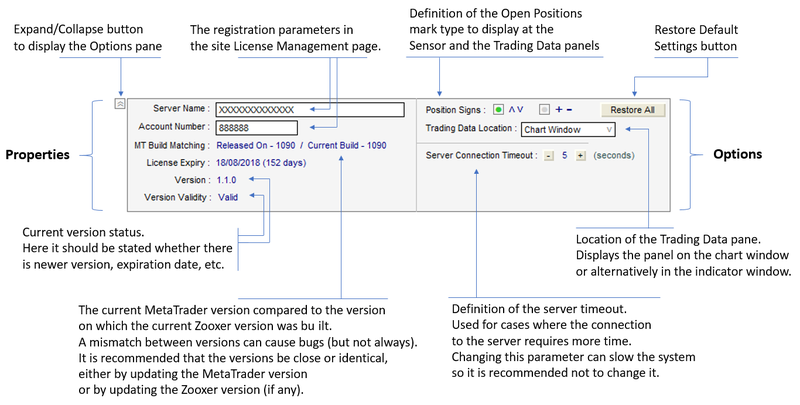 Such an examination, especially for intraday trading traders, but not only, should be done at any given moment, and necessarily causes a delay in deciding whether and when to open a position. The Zooxer presents these power relations of the currencies, which we call “Strong-Weak” in the various panels that we will discuss here, in addition, of course, to other panels and possibilities that exist in the system that we will examine here. A currencies strong-weak indicator presented by detailed and summary graphs. A Sensor service that shows the relevant pairs that you should pay attention to. The current pair trading data, such as Spreads, Swaps, Position costs, Trends, Economic Events and more. 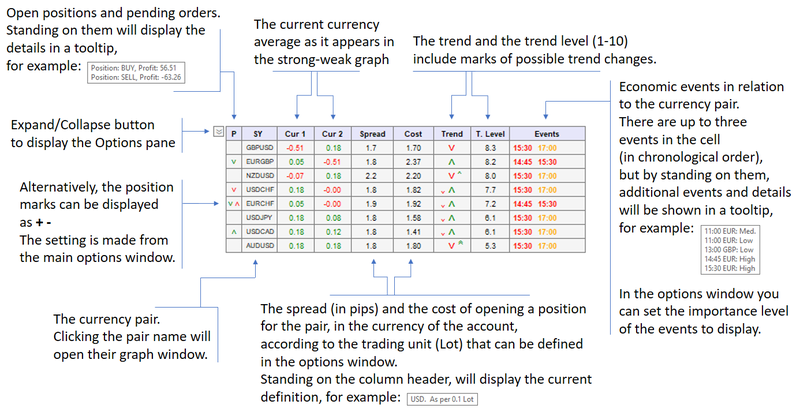 Note: The concepts of “currency change level“ and “current currency average” that appears here are identical concepts. A bar graph to display the currency status in all pairs against which it is traded, including the high and low markings recorded and the average value display. Displays the percentage change of the pair currencies (average values recorded) throughout the day. The more a particular currency is involved in most pairs so its “strong-weak” average will probably be more accurate. The “strong-weak” graph display is not affected by the time display of the pair chart at the MetaTrader (H1, H4, M5, etc. ), but the times are according to the selected tab (2 min/5 min). Displays the pairs to focus on at any given time, according to the parameters defined in the sensor options pane. The Trend Level is based on the “Strong-Weak” status of the currencies and various parameters related to this feature (taking into account the number of pairs involved) and additional calculations (Indicators, graphical analyzes and more). Pay Attention! The Trend Level of the pairs presented in the Sensor and in the Trading Data pane is not a recommendation to open a position but indicates the level of the pair activity and therefore constitutes a recommendation to focus on those pairs with a high trend level. Set up various options of the sensor. Note: The level of influence of the options in the first section (Max Spread, Max Cost, etc.) on the displaying, is more powerful than the level of influence of the options in the other sections. For example, if the Max Spread is set to 5 pips and in the second section the Min. 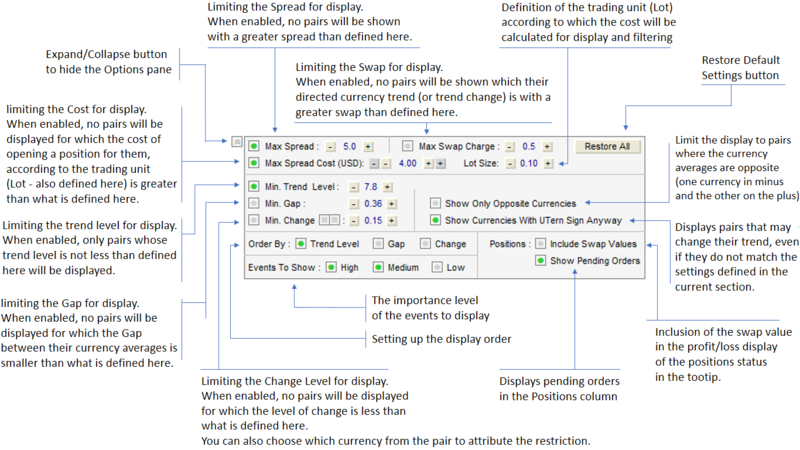 Trend Level is set to 8, the Sensor will not display pairs whose spreads are greater than 5 if their Trend Level is higher than 8 (and so also for the rest of the options in the section). 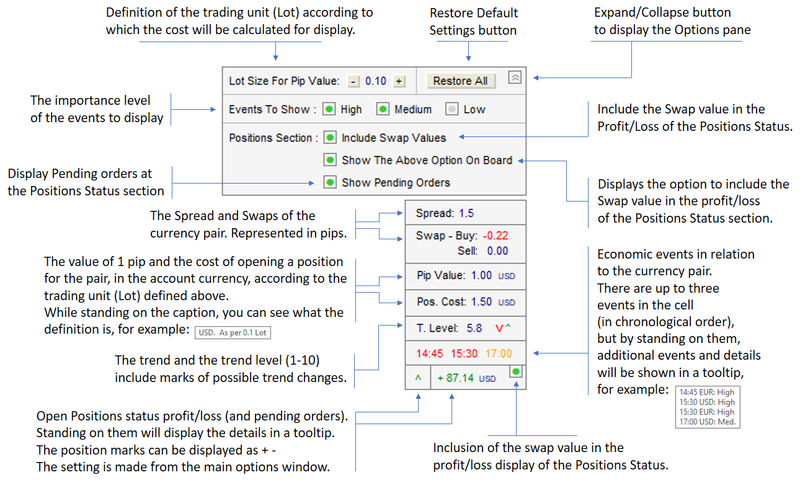 Presenting trading costs and relevant information for the currency pair. Displays relevant information about the Zooxer system and settings of primary properties.